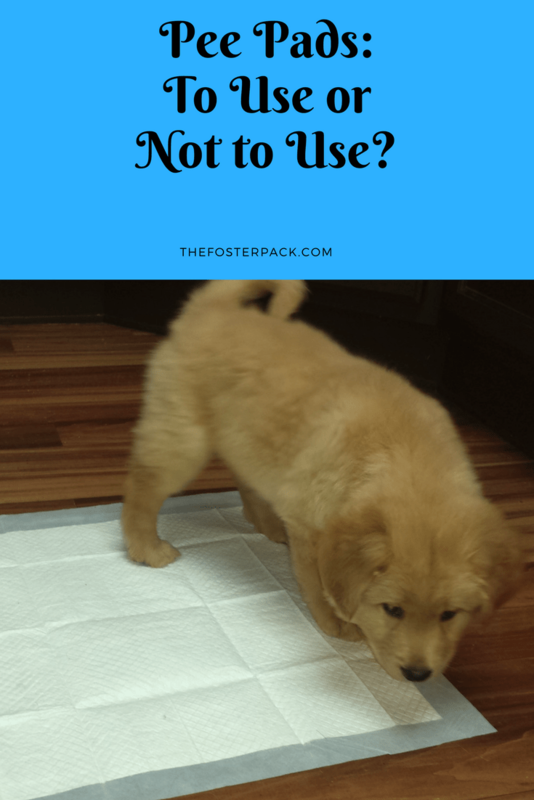 Home > Life with Dogs > Dog Training > Pee Pads: To Use or Not to Use? Pee Pads: To Use or Not to Use? [amazon_textlink asin=’B00MW8G62E’ text=’Pee pads’ template=’ProductLink’ store=’fosterpack-20′ marketplace=’US’ link_id=’32713ad7-4cd0-11e8-b354-7d1b7fff6ac4′], I thought they were my savior when I started fostering dogs. Especially dogs with medical problems that made it impossible for them to go any length of time without a potty break. They covered my carpet and made it a lot easier to clean up accidents. Little did I know what happens when a dog becomes used to using the training pads. Now I find them to be the bane of my existence. Now that all of the carpet in the house has been removed, and indestructible hard floors replacing it, I find pee pads to be a bigger mess than they’re worth. I’ve been reading up on the subject of pee pads lately, and it seems the jury is divided on the use of them. They have their good points, but a lot of bad ones too. Obviously they’re great for a litter of young puppies. To help keep the messes to a minimum, and start house training early. Young puppies shouldn’t be taken outside, where other animals have been, until they’ve had their shots. They’re great during doggy medical issues. And/or senior dogs who just can’t hold it anymore. And handy for city dwellers who don’t have quick and easy access to the great outdoors. Also, for people who work very long hours, and can’t get a dog walker. And for senior citizens or disabled people who can’t walk their dogs often. Your dog is going potty in the house. Even on pee pads, there will be smells. Dogs are creatures of habit, moving pee pads can be tricky. The dog needs to learn that the pad itself is the potty thing, not the spot where the pad is. It’s hard, really hard to break a dog of the habit of going to the bathroom in the house. Especially in areas with inclement weather, and dogs who dislike it. Dogs have really bad aim. Hitting a 2′ by 2′ pad, without it spraying over the edge, seems to be near impossible for male dogs. Females are only slightly better. Some dogs like to shred the pee pads. Especially puppies. Although relatively cheap, it’s still another dog related expense. So in closing, my personal opinion is that, unless you are in one of the situations listed in The Good section, you avoid training your dog to use pee pads. What are your thoughts, and opinions on pee pads? A savior, or the spawn of Satan?